My name is Deborah Taylor and I live in South Grafton in the Clarence Valley. We are on the border of the Bundjalung nation with Gumbaynggirr and Yaegl. My affiliation is to both nations, my father for Gumbaynggirr and my mum for Bundjalung. My mum was born in Box Ridge Coraki and descended from the Olive/Cowan families and was one of seven sisters and one brother. The Clarence Valley is where she married my dad (Albert Taylor) and they reared their family in Grafton. I grew up around rivers fishing and catching turtles in country creeks, swimming in the Clarence, fishing and foraging in the ocean. My dad shot kangaroos and thats what we ate as well as bush foods in season, these were treats. There were days we went as family just us or our extended family to the bush or seaside to practice hunting and gathering and even then the places to go were limited. Now it is more restricted and to me those are precious memories of different times. 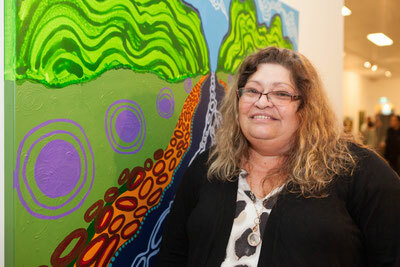 My works are of landscapes and I want to depict that these were created long ago and the Bundjalung peoples have always been a part of the land and are imprinted in it’s core and no matter what layers eg structures, arenas, houses etc are put on the land, it is still Bundjalung and always will be.